The beautiful sound of Lenny Breau style harp harmonics has mesmerized generations of guitarists. From fingerstyle legends like Chet Atkins to guitar gurus like Ted Greene, Lenny’s influence is undeniable. Even in the younger generation of YouTuber guitarists covering fingerstyle arrangements by Tommy Emmanuel, you can hear these harp harmonics everywhere! Dreamy, atmospheric and sometimes impressionistic – this technique along with the use of colorful jazz chord voicings enables guitarist to get out from typical ‘drop voicing’ sounds. 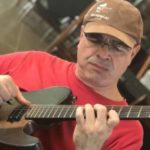 Brazilian jazz guitarist Genil Castro, a master at this style makes his Mike’s Master Classes debut with the first of two videos guiding us through this technique. The focus in these videos is not just on how play artificial harmonics (you can find those kind of videos online) but how to MUSICALLY apply the technique and expand your harmonic vocabulary. It’s not enough to be technically proficient – you have to be harmonically aware to really maximise this sound. Musical applications of the technique on Stella By Starlight and the Ivan Lins song, Septembro. If you’d like to really gain control of this technique and incorporate it smoothly into your playing, this master class is for you. Get it now and expand your guitar’s harmonic vocabulary today. This masterclass includes Soundslice enhanced notation of all written examples so you can can loop, slowdown and study each example as you go through the video. I think many of us grasp the basic idea of artificial harmonics but seek a little more in terms of how to practice and to see additional possibilities. Genil is a very articulate teacher and I was more impressed with several insights that he provided than he basic technique (e.g., how we acquire musical knowledge). One thing that is included here are 3 and 4 note simultaneous (as opposed to the “waterfall”) voicings that include artificial harmonics. You can find the basic technique elsewhere but this is a good treatment of it.